Making Greeting Cards Is Fun! Start making greeting cards today with the free printables and templates on this papercraft website. 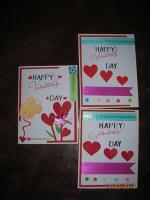 Cardmaking is a wonderful hobby to enjoy with your family and friends. 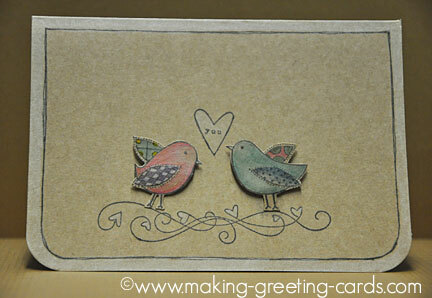 Click here to view step-by-step instruction for making this love birds greeting card. In fact, handmade stationery is becoming more and more popular and it's now a novelty to send homemade greetings. 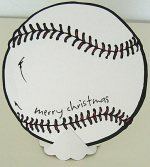 Have you ever look at a handmade card and thought to yourself, "So beautiful! I wish I know how to make my own." Well, now you can! Imagine people receiving your homemade greetings with your name on the back! Card crafting is easy. Many people are creating their own and so can you. 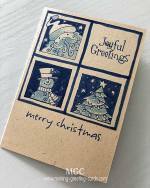 Make your own greeting cards and sign them by rubber stamping "Handcrafted by (YOUR NAME)" or Specially Created for YOU by (YOUR NAME) on the back of every of your handmade creations. Isn't that cool! 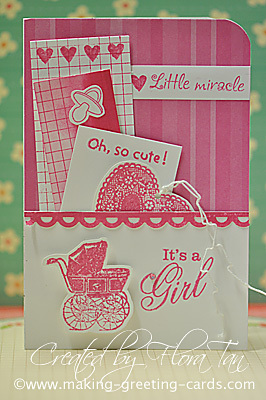 This cardmaking website is undergoing a major makeover. You'll notice that some pages are sporting a new look while most of the others are still the same. Reason being that I'm working slowly to give this making greeting cards website a newer and better look and more user-friendly navigations. And most important, I'm making it mobile compatible so you will be able to view this website comfortably on your mobile phones at anytime and anywhere. And of course, I'll be adding more new cards and interesting and useful stuff to the site. So please do bear with me as I try to make this change as smooth and quick as possible. Thank you for your understanding. Taking up cardmaking as a hobby is not expensive since you should have most of the supplies for making all kind of greeting cards in your home. For a basic homemade card, all you need is paper, cutter, glue and some color pencils. But though inexpensive, making your own greeting cards has many benefits. Creating beautiful homemade cards is such a rewarding way of spending time with family and friends. The joy of gathering cardmaking ideas, paper, embellishments, and other card making supplies to make your stationery and the joy that the handmade greetings give to the recipients are just feelings that cannot be purchased. Receiving a handmade greeting card is so special, isn't it? 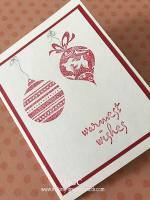 So start making greeting cards in the comfort of your home by following the instructions on this cardmaking website. Not So Crafty? This Is For You! To you who just are not the paper, scissors and glue kind, don't despair. Making greeting cards as a hobby is still a possibility. Yes, you can also make and send your own homemade greeting cards to your friends. You could design your own greeting cards using a graphic software, or take a photo with your digital camera and upload it to your computer. Add an appropriate poem or quote and print it. Voila! A Personalised one-of-a-kind greeting card. So whether you are a die-hard crafter or the digital designer, making greeting cards is a great way to relax, be creative and connect with others. So do start making greeting cards today! As a full-time caregiver to my mom who is suffering from dementia, I don't have big blocks of time to play. But because I'm passionately addicted to card making, I find time for it. For example, when all are asleep in the quiet of the night, I'm up into the early morning, designing and making greeting cards. Say 'Hi!' by commenting below.